A wet weather visibility enhancer specifically formulated for use on clear plastic enclosures such as Strataglass® EZ2CY® and Eisinglass. 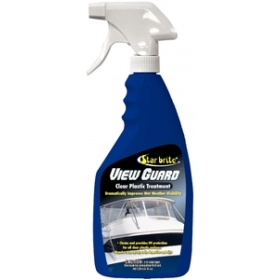 It removes dirt and grit while repelling moisture salt spray and dirt to provide maximum visibility even in rainy conditions. It also provides a barrier to damaging UV rays that can cause clear plastic to crack and turn yellow. "SUPER FAST SHIPPING! ITEM IS GREAT! THANK'S BOATERSPLUS!" "I ordered online, the product came promptly and works great! Thank you!" "This company is top notch with their customer service and support. It will be my pleasure to work..."